I went to L.A. for the first time and forgot my camera. Doh! I brought plenty of other stuff - mainly shorts and tank tops and summery things for sunny California. Turns out I didn't need those at all as Debie and I arrived in the midst of "June Gloom." This concept was unfamiliar to me. When we got off the plane it was cold and grey and not at all as what I imagined when I booked the plane ticket for a West Coast getaway. "Oh, June Gloom," at least 5 people remarked to us in the first thirty minute. As if that explained everything. June Gloom, duhhhh. June Gloom! What is this June Gloom? Is that why my plane ticket was so cheap? I should've known! Anyhow, I had to rely on the iPhone for impromptu photos, like these snapshots that I took from the rental car window as we drove down the street. 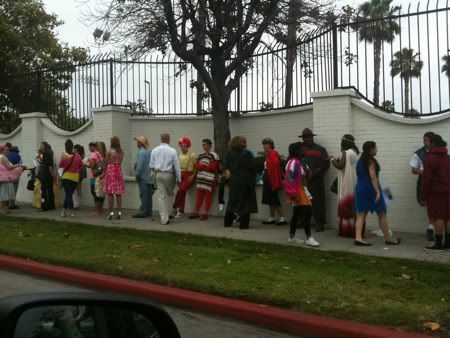 Here is a line of dozens of people wearing costumes of every different cliche. 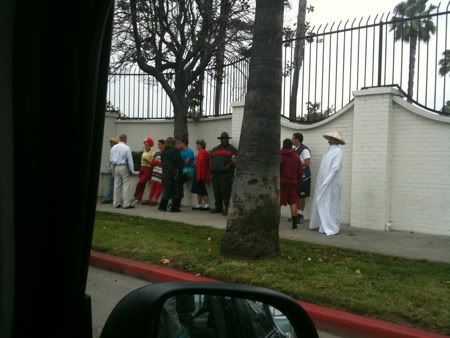 I see a Mexican poncho, a clown, a guy with one of those Chinese hats on, but no Bumblebee Man. Who else can you spot? Posted in Travels and tagged with Los Angeles. July 18, 2011 by Adele Chapin.